Snoring is more than just annoying; it can be a sign of serious health problems. And, when snoring results in sleep apnea, it can be dangerous. In fact, a new study indicates that obstructive sleep apnea (OSA) is as detrimental to your heart’s health as diabetes. OSA is a common sleep disorder that has long been linked to heart disease. It is known to raise the risk of hypertension, arrhythmia (irregular heart rhythm), heart attack, stroke, heart failure, and even sudden cardiac death. And, a new study from Romania indicates that OSA may be more dangerous than previously thought. The research team found that people with moderate to severe OSA had endothelial dysfunction (problems in the lining of blood vessels) and stiffer arteries than those without OSA. And, the results for people with OSA were similar to those of patients with diabetes. The researchers also indicated that snoring could be a warning sign for OSA or even a sign that serious heart problems could be developing. If you snore or experience apnea, it’s important to see a sleep specialist who can determine a course of treatment. The most effective immediate treatment for apnea is the Continuous Positive Airway Pressure (CPAP) machine, which is most effective. 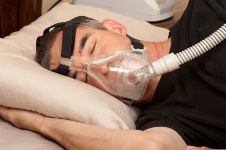 But, while it works, the CPAP is inconvenient, because it requires the user to wear a mask while sleeping. There are alternatives to the CPAP machine, though. OSA can be reduced or even eliminated through healthy weight loss by combining regular exercise with a healthy diet. Mincu, R., et al., “Treat snoring to avoid deadly heart failure,” European Society of Cardiology, December 5, 2012.